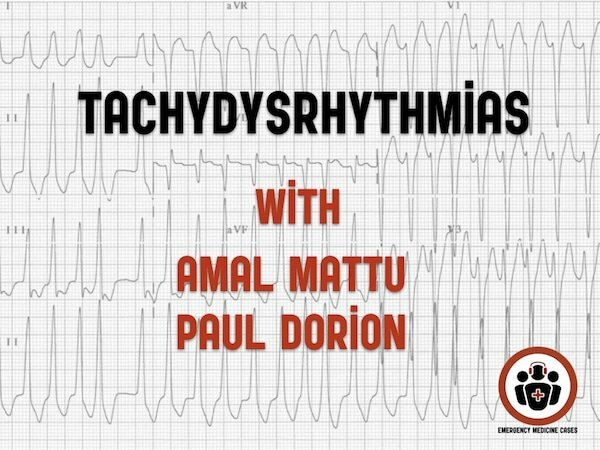 Cite this podcast as: Helman, A, Mattu, A, Dorion, P. Tachydysrhythmias with Amal Mattu and Paul Dorion. Emergency Medicine Cases. July, 2018. https://emergencymedicinecases.com/tachydysrhythmias/. Accessed [date]. Asking these three questions will help classify any tachydysrhythmia in most cases. 2. Narrow or wide QRS? 3. Are there P waves? P-QRS relationship? 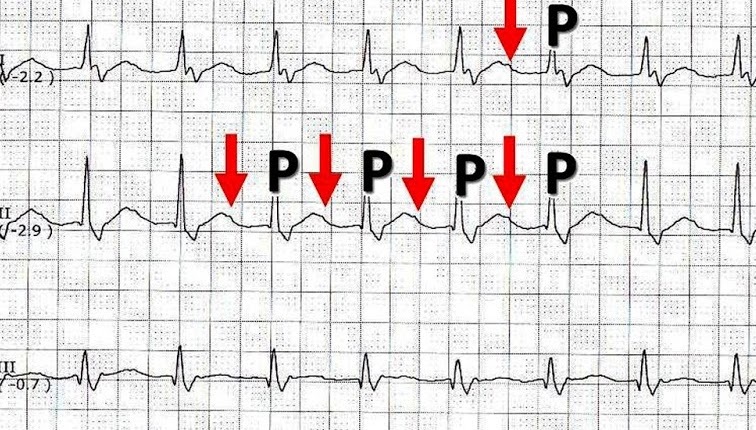 How many P waves for each QRS? Wide & regular = ventricular tachycardia until proven otherwise. Clinical stability does not differentiate between VT and SVT with aberrancy. Despite multiple ECG algorithms and rules to distinguish VT from SVT with aberrancy (Brugada, Wellens, Vereckei, R wave peak time) none are better than 90% specific to identify SVT with aberrancy. No feature or combination of ECG features is 100% specific for SVT with aberrancy. Hence, using an algorithm/rule, there is a 10% chance that you will label VT as SVT with aberrancy erroneously and if you treat the patient with AV nodal blockers, cardiovascular collapse may result. 1. Prior MI, heart failure, recent angina and advanced age. Remember that although advanced age makes a wide complex tachycardia VT much more likely than SVT with aberrancy, up to 50% of patients under 40 years of age who present with a wide complex regular tachycardia with have VT. In addition, response to adenosine does not rule out VT.
As per ACLS guidelines, If any tachydysrhythmia presents as unstable, the treatment of choice is synchronized electrical cardioversion. For many stable patients, electrical cardioversion may be the preferred treatment of choice for VT. For example, electrical cardioversion should be considered in all patients with known heart disease and VT regardless of clinical stability, as the risks of antidysrhythmic medication are probably higher than those of electrical cardioversion in this patient population. Many patients with known heart disease and VT may not be considered “unstable” according to ACLS guidelines (those with hypotension, decreased LOA, acute heart failure or ischemic chest pain), but nonetheless may have poor cardiac output and be unable to tolerate antidysrhthmic medications. In patients with known LV dysfunction and VT, even with normal BP, consider incipient shock and immediate cardioversion. Remember that cardiac output can be dangerously low while the patient maintains a “normal” BP. Blood pressure ≠ cardiac output. Avoid the “verapamil death test”! Do not give a calcium channel blockers to a patient with a wide complex tachycardia. Accelerated Idioventricular Rhythm (AIVR). This is a reperfusion rhythm often seen post-lytics for STEMI; Think of “slow VT”. The treatment is observation, not medication. ->Rx: procainamide, as per the PROCAMIO study. 4. Catecholaminergic Polymorphic VT (CPVT): Heritable VT in young patients (teens/20’s) presenting as polymorphic or bidirectional with a LBBB pattern and inferior axis. The 2016 PROCAMIO RCT trial compared IV procainamide and amiodarone for the treatment of acute but stable sustained monomorphic VT. Procainamide was associated with less major cardiac adverse events and a higher proportion of tachycardia termination within 40 minutes. Procainamide is currently considered to be the first line medication for sustained monomorphic VT in stable patients. VT is too slow for ICD to recognize. Treat as you would any VT.
Recurrent episodes of VT. Treatment involves prevention, which is usually a combination of IV amiodarone, beta blockade and sedation. Consider causes such as ICD malfunction, electrolyte imbalance and severe CHF. Magnet? If an ICD patient is not in VT but their ICD is delivering shocks, place a magnet on the ICD to put it into VVI mode (pacing preserved, shocking disabled). 2. Examine all 12 leads: look for signs like a sawtooth pattern or 2:1 conduction to suggest flutter. 3. Continuous atrial activity: in flutter, there is usually no isoelectric baseline compared to SVT. 4. SVT is regular, like clockwork. The REVERT trial that compared the effectiveness of a modified vs. “standard” Valsalva to convert SVT to sinus rhythm showed a NNT = 3, however real world experience does not seem as promising. This difference may be due to the study control group being seated in the “standard” Valsalva group as apposed to supine. What is the preferred medication for conversion of SVT to sinus rhythm, Adenosine or Calcium Channel Blockers (CCBs)? Diltiazem is at least as effective as adenosine for conversion of SVT and has the advantage of lasting longer and not inducing an uncomfortable experience (often described as a feeling of near death) for the patient as observed with adenosine. Avoid all AV nodal blockers including amiodarone. Blocking the AV node may precipitate a fatal ventricular tachydysrhythmia as conduction will preferentially travel through the accessory pathway. Treat with electrical cardioversion or procainamide. Atrial Flutter is easier to electrically cardiovert, but more difficult to chemically cardiovert or rate control compared to Atrial Fibrillation. Refer patients with new atrial flutter to an electrophyiologist as it is almost always responsive to ablation while difficult to chemically cardiovert or rate control. A recent study by Stiell et al. in the Annals of Emergency Medicine looked at 30-day outcomes for patients presenting to the ED with AF or flutter. ED patients are often told on discharge from the ED to return if they have recurrent symptoms of AF resulting in a high bounce back rate. Many of these patients are young and otherwise healthy. In these patients, isolated AF is almost always a benign entity. Educate otherwise healthy patients with paroxysmal AF that their disease is not life threatening and that it usually resolves on it’s own or with outpatient treatment. Teaching patients to fear AF results in needless visits to the ED and increased patient anxiety. Jastrzebski M, Kukla P, Czarnecka D, Kawecka-jaszcz K. Comparison of five electrocardiographic methods for differentiation of wide QRS-complex tachycardias. Europace. 2012;14(8):1165-71. Szelényi Z, Duray G, Katona G, et al. Comparison of the “real-life” diagnostic value of two recently published electrocardiogram methods for the differential diagnosis of wide QRS complex tachycardias. Acad Emerg Med. 2013;20(11):1121-30. Lim SH, Anantharaman V, Teo WS, Chan YH. Slow infusion of calcium channel blockers compared with intravenous adenosine in the emergency treatment of supraventricular tachycardia. Resuscitation. 80(5):523-8. 2009. Appelboam A, Reuben A, Mann C, et al. Postural modification to the standard Valsalva manoeuvre for emergency treatment of supraventricular tachycardias (REVERT): a randomised controlled trial. Lancet. 2015;386(10005):1747-53. Marill KA, Wolfram S, Desouza IS, et al. Adenosine for wide-complex tachycardia: efficacy and safety. Crit Care Med. 2009;37(9):2512-8. Sheinman BD, Evans T. Acceleration of ventricular rate by fibrillation associated with the Wolff-Parkinson-White syndrome. Br Med J (Clin Res Ed). 1982;285(6347):999-1000. Schützenberger W, Leisch F, Gmeiner R. Enhanced accessory pathway conduction following intravenous amiodarone in atrial fibrillation. A case report. Int J Cardiol. 1987;16(1):93-5. Gaita F, Giustetto C, Riccardi R, Brusca A. Wolff-Parkinson-White syndrome. Identification and management. Drugs. 1992;43(2):185-200. Boriani G, Biffi M, Frabetti L, et al. Ventricular fibrillation after intravenous amiodarone in Wolff-Parkinson-White syndrome with atrial fibrillation. Am Heart J. 1996;131(6):1214-6. Tijunelis MA, Herbert ME. Myth: Intravenous amiodarone is safe in patients with atrial fibrillation and Wolff-Parkinson-White syndrome in the emergency department. CJEM. 2005;7(4):262-5. Stiell IG, Clement CM, Rowe BH, et al. Outcomes for Emergency Department Patients With Recent-Onset Atrial Fibrillation and Flutter Treated in Canadian Hospitals. Ann Emerg Med. 2017;69(5):562-571.e2. 1. Which of the following ECG findings does NOT suggest ventricular tachycardia? VT is very likely if Pave criteria is met: R-wave peak time is more than 50 ms in Lead II. 2. Which of the following could present as a wide complex regular tachydysrhythmia? Hyperkalemia can present with a wide complex regular tachydysrhythmia usually with a HR of less than < 120 bpm. 3. Which of the following describes the best treatment for stable monomorphic and polymorphic VT? For many stable patients, monomorphic VT is the classic VT we see in older patients that are scar-mediated. The medication of choice is procainamide if the patient is stable. Polymorphic VT is usually related to a cardiac ischemic event and the medication of choice is amiodarone. 4. A 73 year old male with a history of coronary artery disease and hypertension arrives in your ED with palpitations. He has had 2 previous MI in the past requiring PCI, and his BP is usually 160/90. He is current stable with a BP of 120/80, normal LOC, with no signs of heart failure or ischemic chest pain. 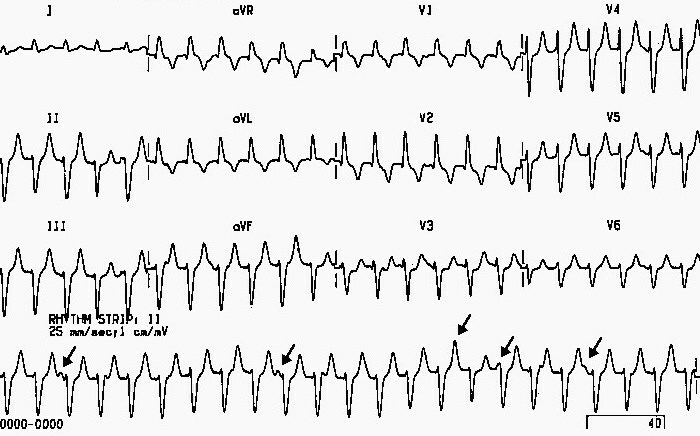 On his EKG, you see a wide complex regular tachydysrhythmia. You diagnose this patient with VT. What is the preferred treatment of choice in this patient? For many stable patients, electrical cardioversion may still be the preferred treatment of choice for VT.
5. A 23 year old female who is previously healthy, presents to your ED with a 2 hour history of palpitations after working out at the gym, which she does regularly. She is currently stable with a BP of 110/70, normal LOC, with no signs of heart failure or ischemic chest pain. She is placed on telemetry and you noticed that her ECG tracing shows periods of non-sustained monomorphic VT. How would you treat this patient? This patient likely has exercise induced nonsustained monomorphic VT. This condition is best managed with beta blockers as an outpatient. Sustained monomorphic VT is best managed with electrical cardioversion or procainamide. 6. A 63 year old female who has end stage kidney disease, presents to your ED with a 1 day history of palpitations. On further history, she also complains of nausea and paresthesia in all her limbs. Her ECG shows a wide complex tachycardia with a rate of 110. How would you treat this patient? Because of this patient’s history of kidney disease, symptoms and wide complex tachycardia at a HR < 120 bpm, she is likely suffering from hyperkalemia. If unstable, Calcium Gluconate should be administered to stabilize the cardiac membrane potential as well as an insulin and glucose bolus to shift potassium (see Episode 86 Emergency Management of Hyperkalemia for details). 7. An 82 year old male with a history of a coronary stent, presents to your ED with a 6 hour history of chest pain. His initial ECG shows ST elevation in the anteroseptal leads. An hour after his chest pain resolves he starts complaining of palpitations. A repeat ECG now shows a polymorphic wide complex tachycardia. Besides reperfusion therapy, what other therapy would you provide this patient? Polymorphic VT is usually related to a cardiac ischemic event. Amiodarone is the medication of choice for polymorphic VT. Electrical cardioversion is another good option in stable patients with polymorphic VT.
8. A 21 year old male who is previously healthy, presents to your ED with a 1 hour history of palpitations. He is currently stable with a BP of 140/90, normal LOC, with no signs of heart failure or ischemic chest pain. 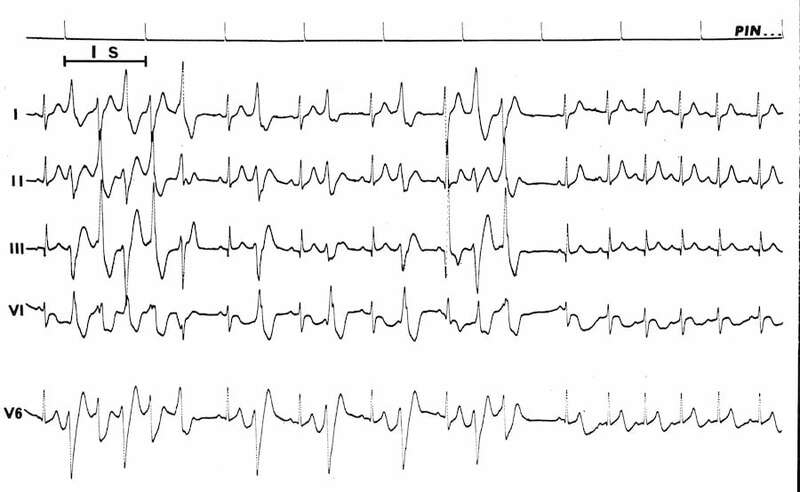 His ECG shows a VT with bidirectional QRS complexes, a LBBB pattern and inferior axis. How would you treat this patient? This patient likely has catecholaminergic polymorphic VT. He should be started on an IV beta blocker. Amiodarone and procainamide should be AVOIDED. 9. 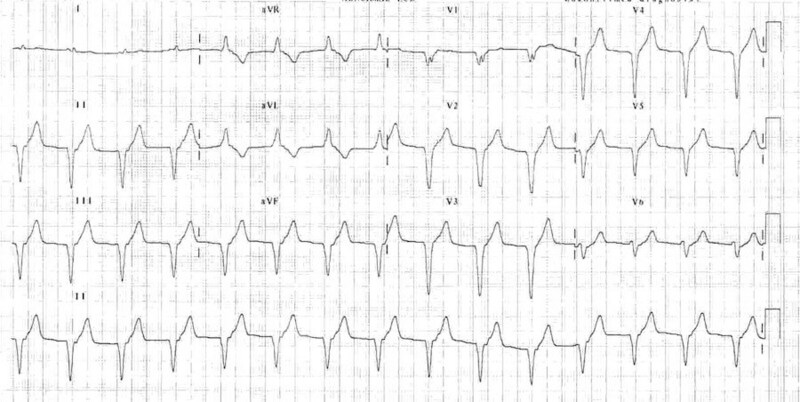 Which of the following is NOT an ECG feature of atrial fibrillation with Wolff Parkinson White syndrome (WPW)? The EKG pattern associated with atrial fibrillation with WPW is irregularly irregular, and has no relationship with respiration. In contrast, HR will vary with respiration in patients with sinus tachycardia. 10. Which of the following is an appropriate treatment for atrial fibrillation with Wolff Parkinson White syndrome (WPW)? Avoid AV nodal blockers, including amiodarone, in patients with atrial fibrillation with WPW, as it may precipitate a fatal ventricular tachydysrhythmia as conduction will preferentially travel through the accessory pathway. Treat with electrical cardioversion or procainamide. 11. Which of the following statements regarding the treatment of atrial fibrillation and flutter are correct? A. Atrial fibrillation is more easily treated by electrical cardioversion and rate control than atrial flutter, while atrial flutter is more easily treated by chemical cardioversion and ablation. B. Atrial fibrillation is more easily treated by chemical cardioversion and ablation than atrial flutter, while atrial flutter is more easily treated by electrical cardioversion and rate control. C. Atrial fibrillation is more easily treated by chemical cardioversion and rate control than atrial flutter, while atrial flutter is more easily treated by electrical cardioversion and ablation. D. Atrial fibrillation is more easily treated by electrical cardioversion and ablation atrial flutter, while atrial flutter is more easily treated by chemical cardioversion and rate control. Atrial fibrillation is more easily treated by chemical cardioversion and rate control than atrial flutter, while it is more likely to be resistant to electrical cardioversion and ablation. Atrial flutter is more easily treated by electrical cardioversion and ablation than atrial fibrillation, while it is more likely to be resistant to chemical cardioversion and rate control. 12. An 52 year old female presents to your ED with a 2 hour history of palpitations. Her initial ECG shows a narrow complex tachycardia. Which of the following findings on ECG suggest that she is in SVT as oppose to atrial flutter? Examine all 12 leads: look for signs like a sawtooth pattern or 2:1 conduction to suggest flutter. Continuous atrial activity: in flutter, there is usually no isoelectric baseline compared to SVT. SVT is regular, like clockwork. 13. You have a healthy 47 year old female in the ED with palpitations. She has a history of SVT. Her ECG shows SVT at a rate of 170. Blood pressure and mentation are normal and there is no chest pain. Which of the following statements regarding treatment are FALSE? A. Adenosine 6 mg or 12 mg IV push is the most effective treatment. B. Diltiazem at a dose of up to 25 mg IV is at least as effective as adenosine. C. Valsalva maneuver should be first line treatment, but it has a poor success rate. D. Modified valsalva maneuver, which includes passive leg raise after bearing down, is more effective than valsalva alone. Although adenosine is highly effective, studies comparing it to calcium channel blockers (eg diltiazem) do not demonstrate superiority. Adenosine also has the unpleasant side effect of giving the patient a sense of doom/death. Valsalva should generally be attempted in all SVT patients before medications are tried. The modified valsalva (as per the REVERT trial https://www.ncbi.nlm.nih.gov/pubmed/26314489) has a reported 43% success rate, though this may be lower in actual practice. Asthma and COPD is common and the use of B Blockers in these patients ought lead to Badness . Not BBlocker Valium and Depraved Flix . If patient has chest infection and noted to be in afib with no similar rhythm in the past ecgs should we anticoagulate them? Afib seems Triggered by infection here but what’s the cut off to decide on anticoagulation then? regardless of infection or no infection anticoagulation should be offered as per CHADS-65 in the Canadian Cardiovascular Society Guidelines (https://www.onlinecjc.ca/article/S0828-282X(16)30829-7/pdf). Important to realize that paroxysmal Afib has just as high a risk for stroke as persistent Afib. What about diltiezem in renal failure patients? Does it make anything worse? Do you need a lower dose? And those with CKD III (not on hemodialysis), will your dose(s) of diltiezem cause worsening Kideny function temporarily…or permanently? Thanks for the detailed description. excellent in every aspect. Wat about valvulur atrial fibrillation( Rheumatic heart disease with mitral stenosis) , unknown duration and unstable on presentation? ?